Excellent location for sightseeing with walkable distances even for children (we walked almost everywhere). Near restaurants and grocery. 10 min walk from Termini. The building is well maintained and quiet even though is near a busy street at night. Nice for families. The bed and sofa bed were comfortable, the bathroom well equipped and with a very nice shower. It was walking distance to the main attractions (Coliseum etc), it was a nice apartment and had a kitchen for those doing a longer stay. Sound proof rooms for an excellent sleeping experience. Clean spacious and comfortable! Nice little kitchen. Amazing location! Room was beautiful and convenient to places we wanted to go. It was nice and clean. Good size apartment. Great location. AC worked really well. No breakfast was included. The room was reasonably clean but towels and rooms cleaned was every 3 days so we had to reuse our towels. Air cons were switched off at 12am till around 8am when you needed them most. Their mentality was to keep them on during the day which is ridiculous as tourists are never home during the day and only go to their rooms to sleep. We had no view or balcony to anything other than a neighbouring court yard. Close to the coliseum though and around 1 km walk to Trevi, 2 km's to Spanish steps. Lots of walking. The worst thing was the drain in the shower was blocked and we would end up with a bsckflush of dirt from the drain coming up to our ankles - very worrying indeed. The location was excellent. Close to all main attractions. I loved this place, was very clean, the location is wonderful very comfortable setting in the apartment for a family with kids and adults. I had to print something and it was amazing to see how helpful the girls were. One of our best sellers in Rome! Casette Monti offers free WiFi and air-conditioned apartments. This property set in the heart of Rome's picturesque Monti area is approximately 1,650 feet from the Coliseum. Apartments all come with a flat-screen satellite TV, a kitchenette and a bathroom with hairdryer. Towels and bed linen are provided. Apartments set 1,000 feet from the main building are also available. Guests can enjoy a range of breakfast options at a nearby hotel. Piazza Venezia is 1,950 feet from Casette Monti, while the Roman Forum is a 10-minute walk away. Rome Ciampino Airport can be reached in 30 minutes by car. 뀐 Located in the real heart of Rome, this property has an excellent location score of 9.1! When would you like to stay at Casette Monti? With free WiFi, this one-bedroom apartment features a flat-screen satellite TV, a kitchenette and air conditioning. The bathroom has a hairdryer. With free WiFi, this two-bedroom apartment features a flat-screen satellite TV, a kitchenette and air conditioning. The bathroom has a hairdryer. With free WiFi, this open-plan studio features a flat-screen satellite TV, a kitchenette and air conditioning. The bathroom has a hairdryer. This apartment features air conditioning, dishwasher and toaster. House Rules Casette Monti takes special requests – add in the next step! Casette Monti accepts these cards and reserves the right to temporarily hold an amount prior to arrival. Late check-in is available on request and subject to confirmation by the property. Please note that guests who need to deposit their luggage before check-in time must inform the property 1 day in advance. Please note that check-in and key collection take place at: via della consulta 1b, ROMA 00184. Mouldy in kitchen and bathroom. It was amongst lots of restaurants and attractions. Nothing impressing except the location. The water was often cold. The bed in the kitchen/living area wasn't ideal. The property could have had a few more cups etc. We were told we could leave our luggage at a cost of 65 centissime/hour but in fact it cost 1 euro/hour even when quoting 'Cassette Monti'. It was very clean. The location was excellent. We stayed in an one bedroom apartment with a little kitchenette that was poorly equiped. Since we were travelling with children, the idea was to make some meals at home, with only one tiny tiny saucepan we had to boil pasta in turns. No toaster as well. Besides that the rest was ok.
We had a problem with the toilet flush. It did not work properly. We called the front desk but no one cared. Room cleaning does not exist, there are only every 3 days the towels changed. The equipment in the room was very bad. 2 days before my arrival I asked for an iron and ironing board. It was provided to me, but they were in very poor condition. I could not iron my white shirt because I was afraid it would get dirty through the ironing board. The location of the apartment was very good. It's between the colosseum and the trevi fountain. Both within easy walking distance. A supermarket is also very close to the apartment it calls conad. The prices are pretty good. This was a disaster. First you have to check in in an hotel and then go to the apartment which is not 200 meters away (as they tell you) but much more and it is uphill (just to make your life easier). Then you have to get up to the second floor with your luggage without an elevator. Then the first thing you see is a broken painting (not on the wall but on the floor). Then you discover that most of the electrical sockets don't work. Then you switch on the TV just to discover that the screen is most of the times black and gets "alive" sometimes, just to get black again afterwards. Then, and this is the worst, you discover that the toilet is without a window and the ventilator in the toilet doesn't work. I spent the night with the smell of the toilet and there was the same smell when I woke up. The bathroom was very very small, so it was a challenge to get into it. Not very comfortable. Excellent location, near Cavour subway station with easy access to the city centre of Rome. Clean and small studio flat with all everything you need for a short stay. Avoid at all costs. Pictures are not the actual apartment. Despite requesting quite room with 2 bunk beds we got a studio apartment with a double bed and fold out bed for a family of 4. Extremely noisy street front without working air conditioner. Very poor lighting making it hard to see. Shower not operational. When advising owner/manager of the incorrect arrangements they were less than obliging advising they “can offer no solution. 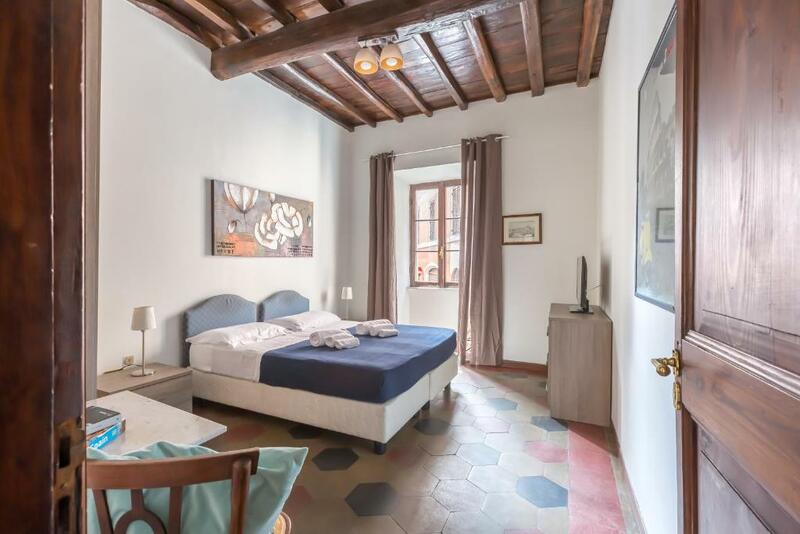 This is what you booked.” The room was extremely hot and noisy, with no ability to shower in the morning we moved straight out and into a fantastic hotel near the termini. This is the worst accommodation we have ever stayed in! Do not stay here!! There was nothing to like. it did not match our booking and the owner was not willing to assist. The bed it's not comfortable at all.